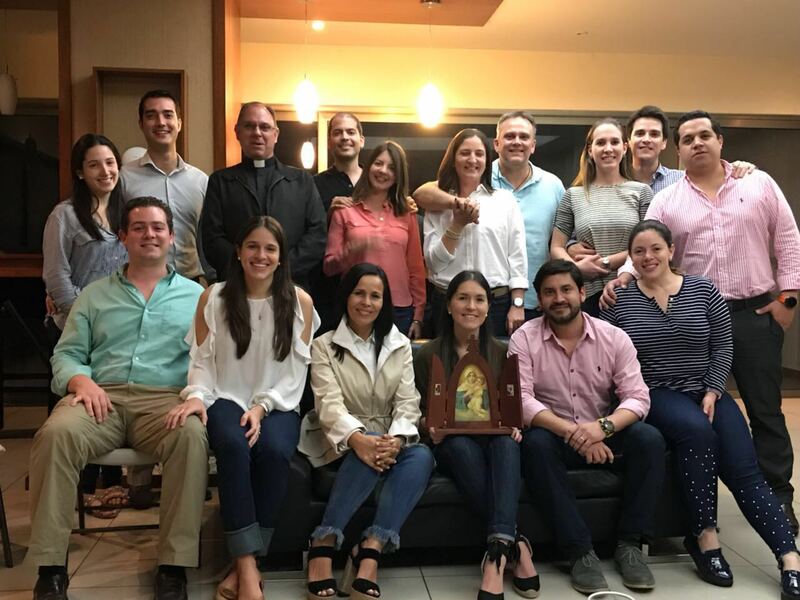 Less than two months from the first anniversary celebration of our Family of Hope Shrine in Costa Rica, the first and only one in Central America, Fr. 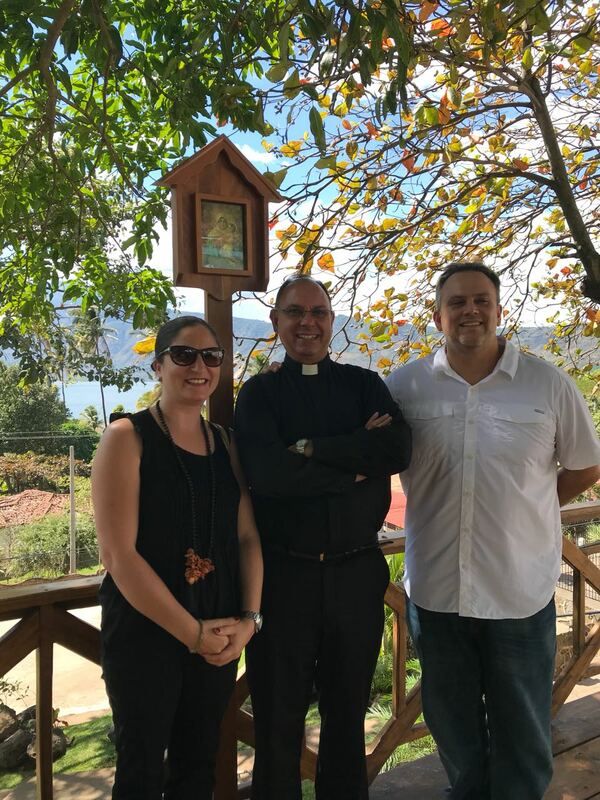 José Luis Correa, adviser to the Schoenstatt Movement in our region, visited San Salvador to meet with what could be considered Schoenstatt’s founding family in that country. Isidro and Patricia Perera and José Alejandro and Anelena Hueda de Martínez, accompanied him; the latter are speakers for groups of young professionals and talks for engaged couples. They were four days of intensive work, which tried to cover all the life that is currently generated in San Salvador. Two groups of recently married, young couples were visited. They were very excited to welcome Father, who presented them with a talk on the Sacrament of Marriage. It was very beautiful to see how eager these couples are to walk together in search of holiness in their marriages from the beginning by Mary’s hand. 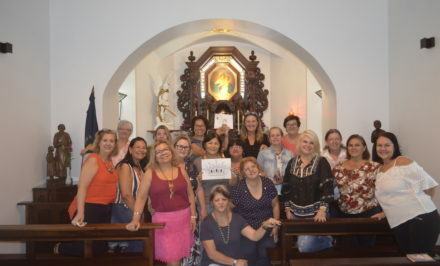 On the second workday, there was a meeting with a group of women interested in learning about Schoenstatt and knowing what to expect from a Mother’s group. 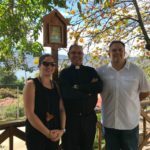 Happily the talk fell on fertile ground, and they not only expressed an interest, but they also were excited about coming to Costa Rica next month to visit the Family of Hope Shrine. At night it was the long-awaited turn for the young professionals that have been very excited since meeting last year. 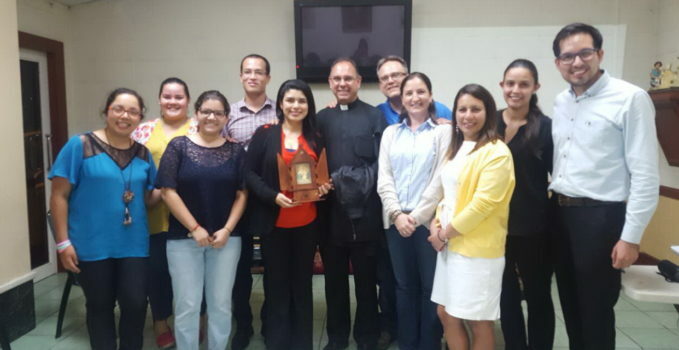 Lee Aguiñada and Malena Hernández, two young Salvadorians that placed themselves at the Blessed Mother’s service, and as they said, they founded the Schoenstatt Youth in San Salvador meet with them and guide them. 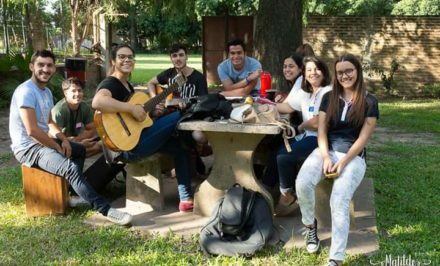 These young people, allies of the Blessed Mother since March of last year, work with Fr. José Luis and they wanted his visit so they could meet these young professionals and spend time with them. 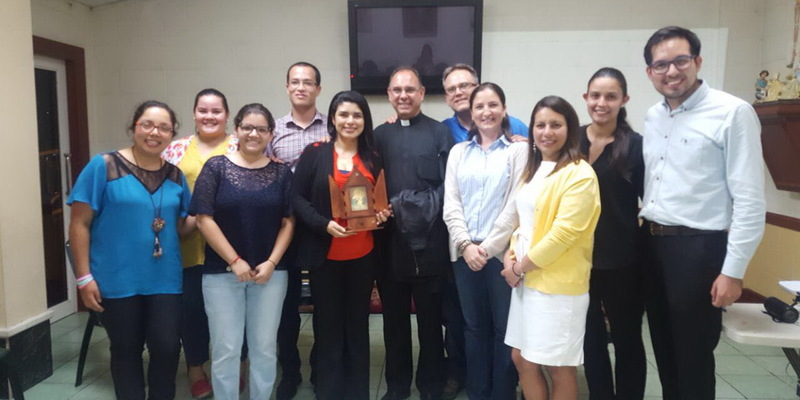 The young people also talked with José and Anelena about their life in Schoenstatt and their work with the young people in Costa Rica. 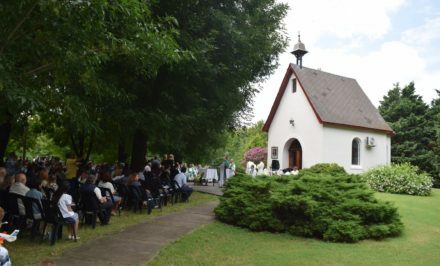 The opportunity was repeated on Thursday, when they gathered a group of engaged couples who were very happy with the message they received from Fr. José Luis and the Martínezes. As part of the visit, Fr. 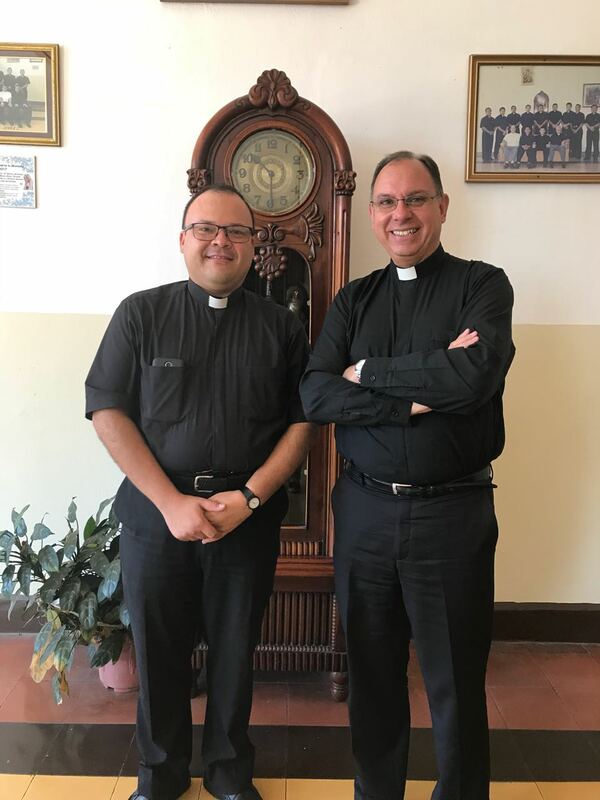 José Luis took the opportunity to introduce himself at the Major Seminary and to speak with its Rector, Fr. Edgardo Reyes. 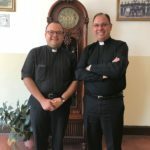 He was surprised that he already knew about Schoenstatt, since he always visits the Shrine that is close to the Vatican when he goes on retreat to Rome, and he affectionately remembers the Sisters of Mary and their delicious cookies. 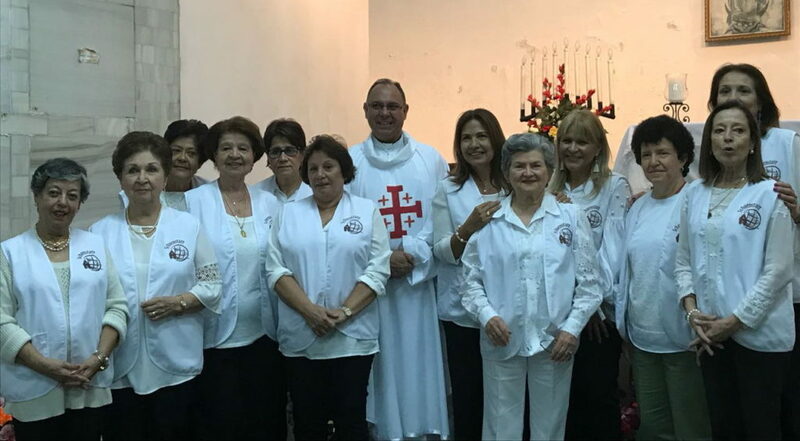 A group of Missionaries of the Pilgrim Mother has existed in San Salvador for more than 20 years, it is coordinated by Ana Mercedes Nieuwenhuis. 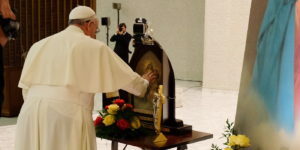 An open talk titled “Pope Francis and his relationship with the Blessed Mother” was organized for them. 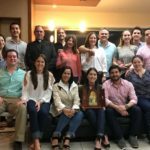 A large group of people met in the parish hall of the Divino Niño Church, a parish that not only has welcomed the Pilgrim Mothers but also, a group of Madrugadores. Fr. 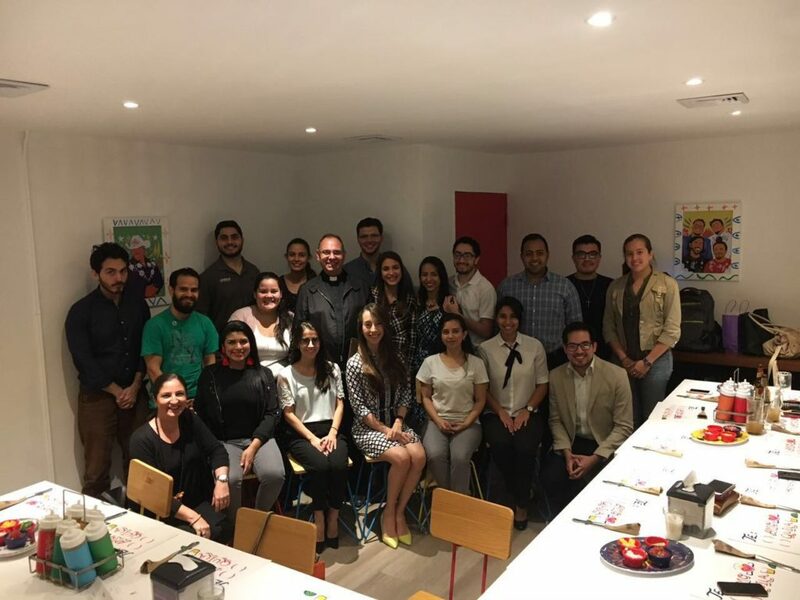 José Luis met with them to greet them and motivate them to participate for the first time in the Madrugadores’ Congress that will be held in June in Costa Rica. El Salvador already has its first wayside shrine, and we could not return to Costa Rica without visiting it. It is located in María Auxiliadora Parish, in the Lago de Coatepeque. Fr. 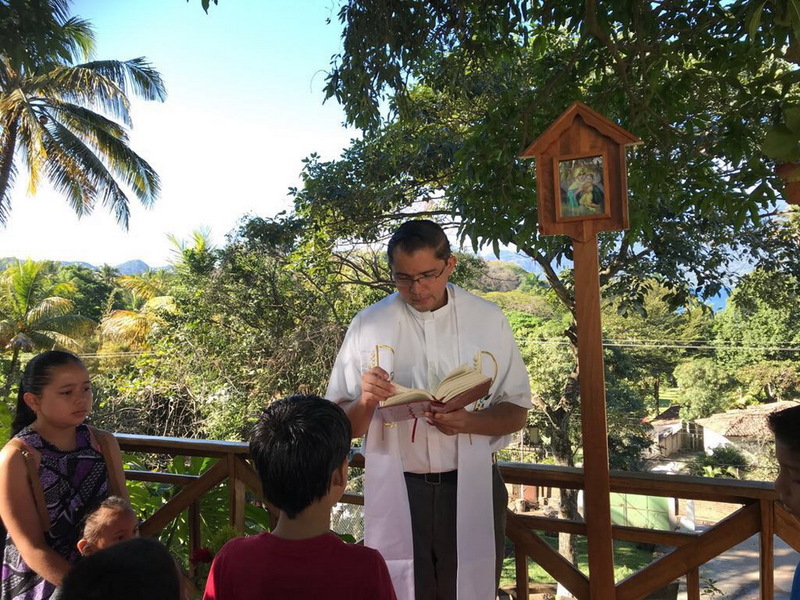 Jorge Soto, a diocesan priest and Costa Rican, has worked with the children of the community, in an apostolate known as Semillitas de Schoenstatt (Schoenstatt’s little seeds) supported by the consecrated María Luisa and the first group of mothers from San Salvador, called Manos de María (Mary’s Hands). 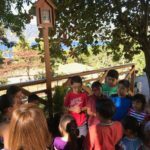 The wayside shrine was blessed on 6 December of last year, and now they meet in front of it with the children who pray to the Blessed Mother. 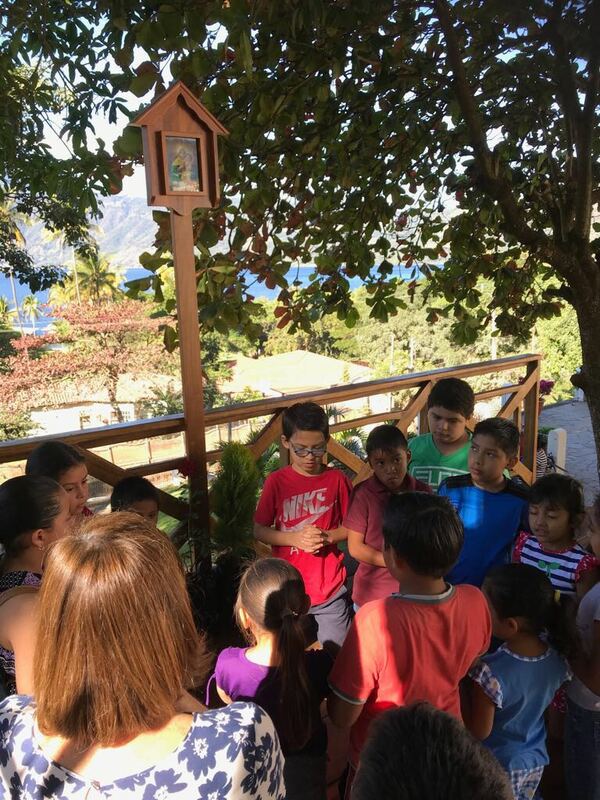 Since last August, Isidro and I said our yes to the Blessed Mother, upon accepting the beautiful apostolate of the San Salvadoran mission, Schoenstatt’s Costa Rica reaching out from our Family of Hope Shrine. We carry out this mission with great joy, since the welcome we have received has really been one of family. 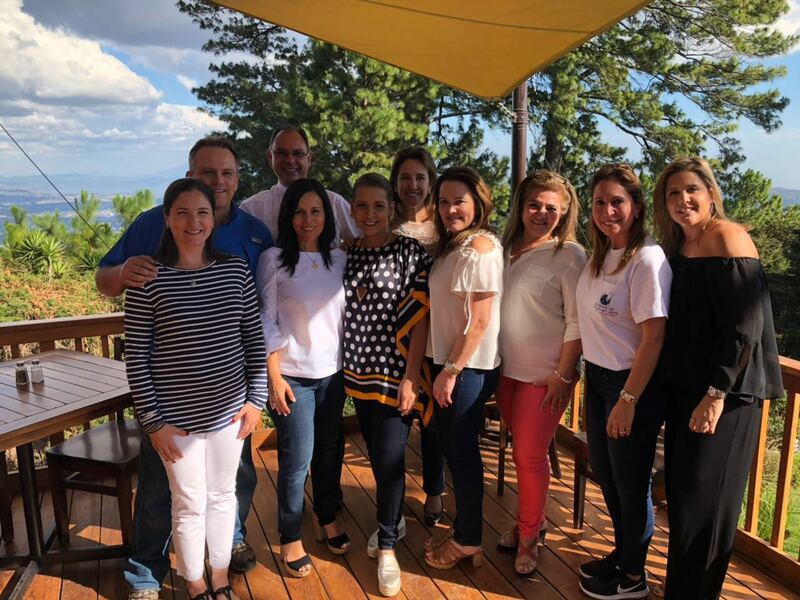 We are amazed by everything that is conquered little by little in San Salvador and how we are meeting people who want to know and learn about Schoenstattt. We are grateful to Silvia and Billy Nasser that have been like family since our first visit. They have welcomed us into their home, and they have been a great help in carrying out this mission in San Salvador. What we pray in the Consecration Prayer: “…I give myself entirely to you…” “…use me…” is realized in every visit to San Salvador. Fr. 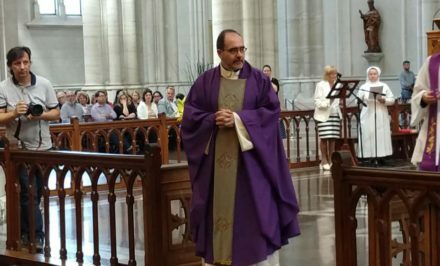 José Luis’ visit left us with new projects, and it is very exciting for us to continue with this mission that the Blessed Mother has entrusted to us.